Curator Sarah Vowles takes a closer look at a spectacular Florentine Renaissance drawing recently acquired by the Museum. It’s always a joy to welcome a new acquisition, but the drawing by Benozzo Gozzoli that the Museum has recently acquired, thanks to the government’s Acceptance in Lieu scheme, has particular resonance for me. Benozzo Gozzoli (c. 1421/24–1497), Study of angels (recto). Pen and brown ink, brown wash, heightened with white and touches of gold, on rose prepared paper, 1459–1463. On one level, of course, it’s a magnificent Renaissance drawing, the most important the Museum has acquired for many years. Gozzoli was one of the leading Florentine artists of his generation, and this is a significant addition to the Museum’s already spectacular collection of drawings from this period. Dating from around 1460, it shows a group of standing and kneeling figures arranged on a sheet of striking pink prepared paper. By using delicate strokes of white heightening, Gozzoli builds up the sense of three dimensionality, emphasising the ridges and swags of the cloth and hinting at the roundness of the forms beneath. He focuses very much on the draperies – the figures themselves don’t interest him at this point. Some don’t even have heads – those would have been studied in other drawings. 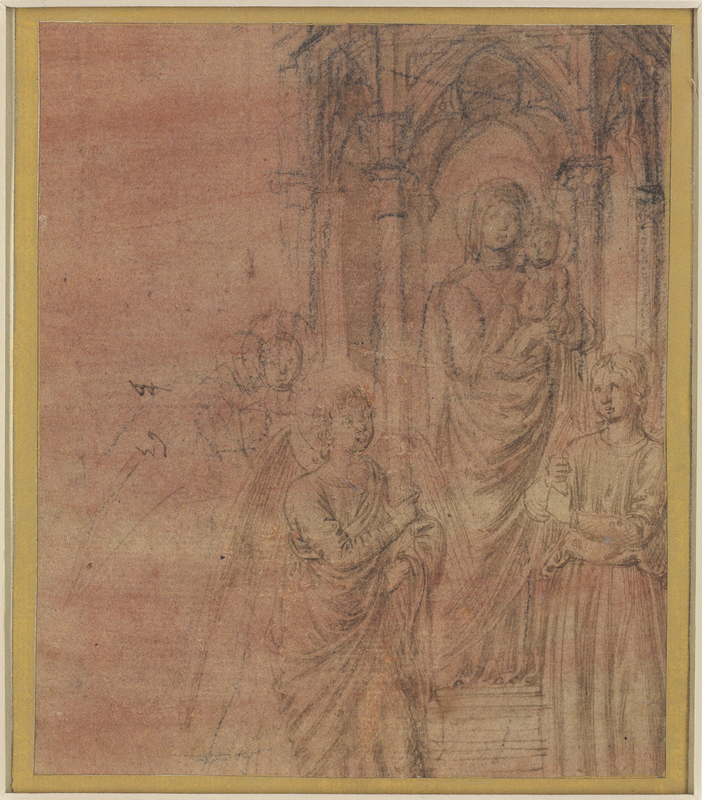 And there would have been many other drawings, because this little sheet of pink paper is a preparatory study for Gozzoli’s great masterpiece, The Journey of the Magi in Florence’s Palazzo Medici-Riccardi. None of them survive, though. This drawing is the only one we can identify with certainty. Benozzo Gozzoli, Entourage of the Young King. Fresco from the Palazzo Medici-Riccardi, Florence. Via Wikimedia Commons. 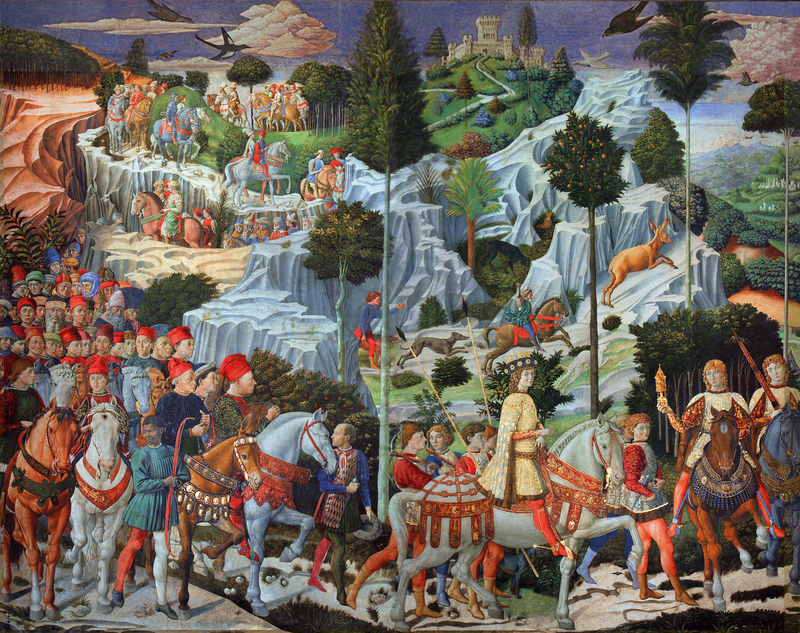 The Journey of the Magi is one of the great commissions of the Renaissance. The patron was Cosimo de’ Medici, grandfather of the famous Lorenzo de’ Medici (or Lorenzo the Magnificent). He commissioned Gozzoli to paint the little chapel in the family’s palazzo, which was completed in stages between 1459 and 1461. The Journey of the Magi was an unusual subject to choose – family chapels in churches often focused on the lives of the saints – but this was a private religious space over which the Medici had full control. They were particularly devoted to the Magi – every year, at Epiphany (the feast of the three wise men), the Medici put together a splendid procession which would weave through the streets of Florence. They might have acted out the roles of the Magi themselves, but contrary to popular belief that isn’t the case in the frescoes. That beautiful blond young man on the horse isn’t the young Lorenzo de’ Medici, as comparison with any portrait of Lorenzo will make abundantly clear. But the Medici are still there. Cosimo and his family are at the front of the Magi’s entourage, along with numerous other portraits which presumably show the great and good of Renaissance Florence. Gozzoli is there too, a dignified expression on his face and his name inscribed in gold letters on his red cap. Benozzo Gozzoli, Angels Worshipping. Fresco, left and right side of the chancel, 1459–1460. Via Wikimedia Commons. 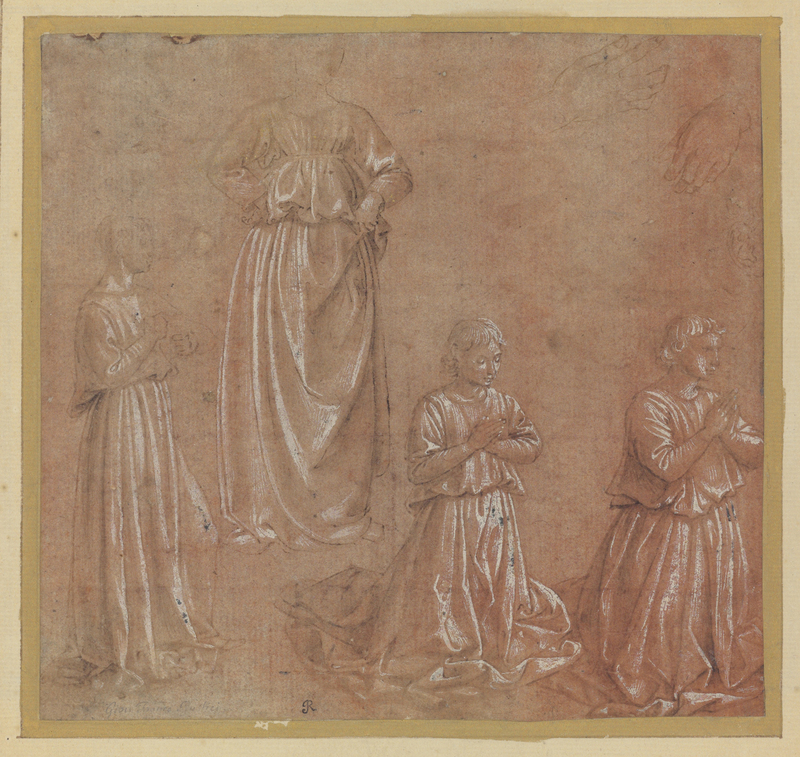 The Museum’s new drawing is a preparatory study for the angels who were frescoed around the altar on the fourth wall of the chapel, the point to which the rest of the procession is heading. They are shown in a beautiful garden, kneeling and standing in neat rows as if arranged for a group photograph. We can identify several angels who must derive from the studies in this drawing. It must have been made at the very final stages of preparation, to make sure that everything was exactly right. It goes to show how carefully Gozzoli prepared his great composition. The angels may be divine, but they’re comparatively unimportant figures in the greater scheme of things. If Gozzoli took this much time over their draperies, then he must have made similar drawings for many other figures in the procession, not to mention portrait studies of the Medici and his other distinguished contemporaries who appear among the crowds. Benozzo Gozzoli, Madonna and Child enthroned with angels (verso of Study of angels). Pen and brown ink, brown wash, heightened with white and touches of gold, on rose prepared paper, 1459–1463. There’s a drawing on the back of the sheet as well, which isn’t related to The Journey of the Magi and, in fact, can’t be linked with any of Gozzoli’s known works. It shows the Madonna and Child enthroned with (more!) angels, sitting beneath an ornate canopy. It’s much less polished than the other side and suggests that Gozzoli was only working out ideas. It has resulted in some odd visual effects. For example, the candlestick held by the angel kneeling in the left foreground rises up and up, and seems to transform into one of the slender columns holding up the canopy. I said that this drawing had particular resonance for me. The first time I ever saw Renaissance art was in a reproductive print hanging on the wall of the vestry in our village church. No one knew where it had come from or why it was there. 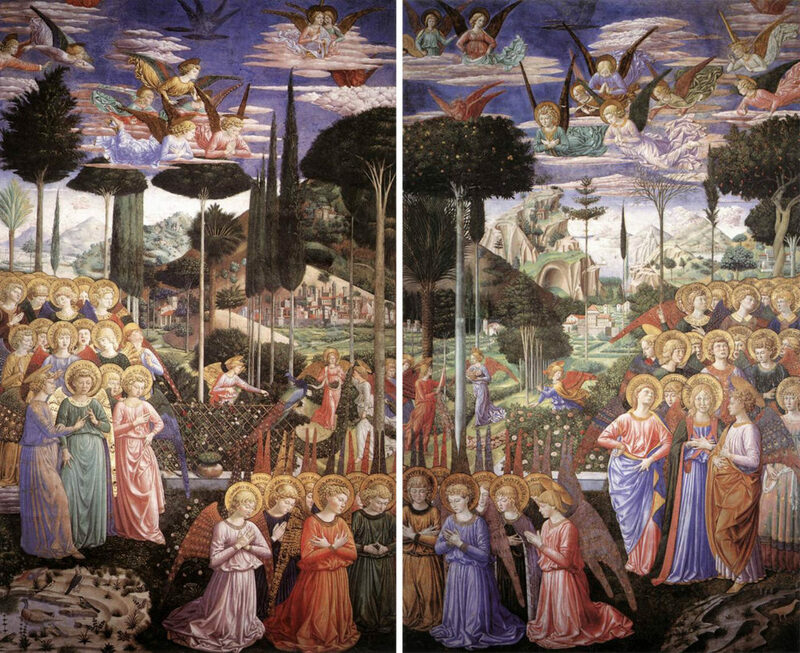 But it showed two panels of angels in a beautiful garden, both sides facing inwards towards a tantalising gap. I spent my childhood looking at that picture. Now, of course, I know that it shows the two walls flanking the altar in Gozzoli’s remarkable chapel – the very frescoes for which this new acquisition is a preparatory study. For me, Gozzoli’s study of angels brings me full circle, to the picture which first made me fall in love with Florentine Renaissance art. The drawing by Benozzo Gozzoli is on display for a limited time in Room 90a, between 5 and 28 September 2017. Learn more about Italian Renaissance drawings with our fascinating giftbook.